Fears the island’s highest volcano Mount Agung is on the brink of erupting forced more than 140,000 people to evacuate. And overnight, Mount Agung was hit by 73 shallow earthquakes, 135 deep volcanic quakes and nine local tremors between midnight and 6am local time today. The volcano continues to release plumes of white steam from its crater and the consensus among volcanologists is that an eruption is the most likely outcome at this point. The Indonesian Center for Volcanology and Geological Hazard Mitigation raised the volcano alert to 4, meaning an eruption could happen at any time. Balinese locals continue to flee the danger zone, which stretches now 7.5 miles around the volcano and white steam has been pouring out of Mount Agung. Bali Volcano News reports that Bali”s Governor Made Mangku Pastika the foreign legates that visitors to Bali do not need to worry about the conditions on Mount Agung said that in the event of an eruption of Mount Agung only 28 villagers in the Regency of Karangasem living in the foothills surrounding the mountain are considered in danger. All the residents of these communities have been evacuated to temporary evacuee centers until the condition subsides. The government has identified a radius of 12-kilometers from the mountain’s peak as areas that need to be evacuated which was already reduced recently to 7,5-kilometers. 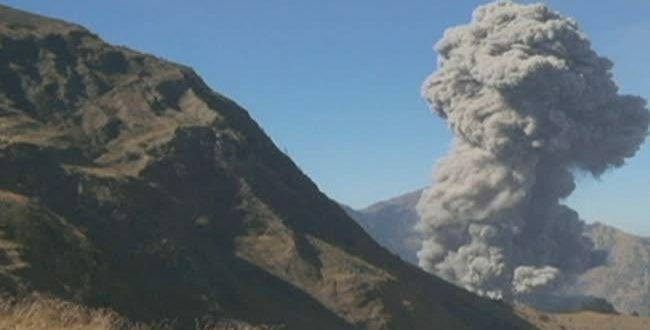 Analysis: The evaluation of observational data indicates that volcanic activity at Mt. Agung remains at a high level. It is still more likely than not that an eruption will result from current activity. Probabilities of eruption, however, can change with time and are dependent on changes in observational data. If an eruption were to occur, it is likely that the first eruption would be small. Larger eruptions could follow initial, smaller eruptions. The size of impending eruptions, however, can not be forecasted precisely. The exact date and time of a possible eruption can not be predicted. CVGHM will, however, issue warnings as early as possible if activity at Mt. Agung changes or if the probability of eruption increases. Residents and tourists who remain outside of the hazard zone may continue their normal activities. The current hazard zone extends as a 9km radius from the summit and up to 12 km from summit towards the N-NE and SE-S-SW sectors. Tourists activities are still considered safe in Bali. Residents and tourists, however, may not enter the Hazard Zones. CVGHM continues to work with BNPB (National Agency for Disaster Management) as well as local governments to improve eruption early warning systems. Tourists and residents in Bali are encouraged to comply with recommendations set by the Government of Indonesia.